Bear Necessities | Aiming for Accuracy Pattern Co.
Bear Necessities is a fun quilt to make that uses four fat quarters (you will have left-over fabrics), plus a background fabric. 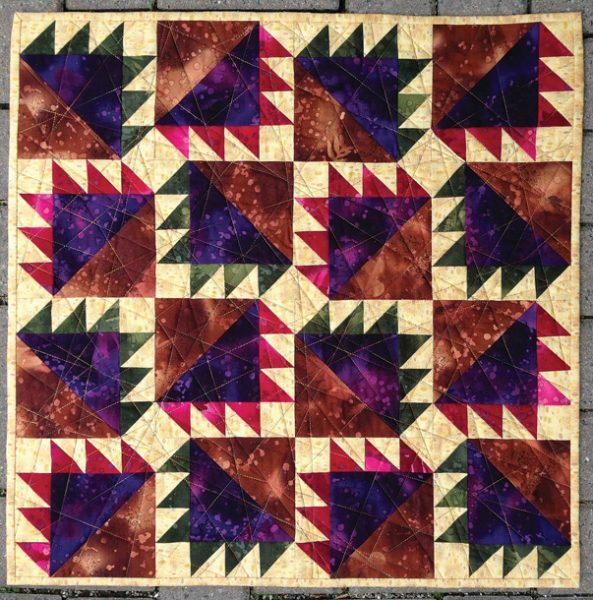 The mini quilt is made up of 16 blocks that each contain one large and six small half-square triangles (HST) and one small square. In my design, two colour ways are used for the small HST units; however, this would make a a great scrappy quilt top too. Mini quilts are excellent as an afternoon piecing project. Mini quilts are lovely as table toppers and wall hangings, and they make excellent gifts. One block with three layout options. Step-by-step, detailed instructions and diagrams. Blank drawings to plan your colours. Instructions are included for using Specialty Rulers (see below), if you have them. These rulers are not required. Four fat quarters for the mini quilt top. You will have left-over fabrics that you may wish to piece together for the backing. ½ yard of background fabric (includes binding). 28″ square of fabric for the backing. These rulers are NOT required to complete this pattern.